Sign into the Action Web control panel here. 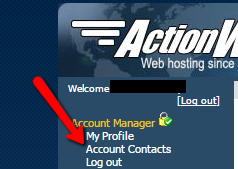 In the top left, click "Account Contacts". Once that page has loaded, click the wrench next to the contact you're wanting to edit. Enter the updated information for that contact, then click "Update" in the bottom right.